Some leaders fundamentally alter the status quo whilst others guide quietly. 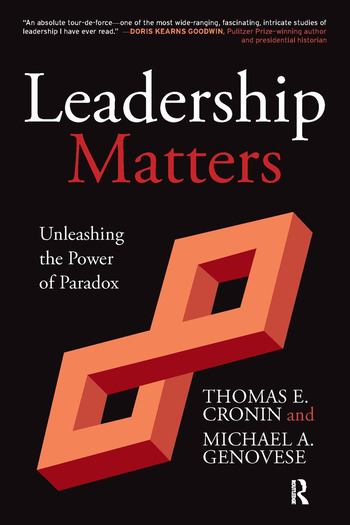 Most leadership books emphasise specific rules, but Tom Cronin and Michael Genovese see leadership as filled with paradox. Leadership Matters offers a different view of leadership - one that builds community and responds creatively to new situations. Cronin and Genovese argue that leadership is about more than just charisma and set leaders on to a different path - to unleash the power of paradox. Thomas E. Cronin is the McHugh Professor of American Institutions and Leadership at Colorado College. He is president emeritus of Whitman College (1993-2005) and a former acting president of Colorado College (1991). He earned a Ph.D. in political science from Stanford University, and is author, coauthor, or editor of a dozen books on politics and government. Cronin is a past president of both the Western Political Science Association and the Presidency Research Group and was honored by the American Political Science Association with the Charles E. Merriam Award recognizing outstanding contributions to the art of government. Michael A. Genovese is Director of the Institute for Leadership Studies and holds the Loyola Chair of Leadership as Professor of Political Science at Loyola Marymount University in Los Angeles. He received his PhD in political science from the University of Southern California and has authored over 30 books and edits a series on the presidency. Genovese has won numerous awards for outstanding teaching and scholarship. "Cronin and Genovese have written a compelling and original book. It is terrific -- a real addition to the leadership canon." "A superb book -- it will have an important place in the literature and in the classroom." "This is a terrific book... destined to become a classic." "Leadership Matters is a highly sophisticated, deeply probing, and remarkably comprehensive treatment of this dynamic and crucial subject." "This book offers unique insights into the field of leadership with stunning examples about what historical and popular leaders can teach us. Cronin and Genovese give us an entirely different perspective on the field. This is a must-read for anyone interested in leadership!" "This book is an absolute tour-de-force -- one of the most wide-ranging, fascinating, intricate studies of leadership I have ever read." "Cronin and Genovese present leadership as 'the most baffling of the performing arts.' They unpack the paradoxes of leadership, provide memorable illustrations, and include nuggets of wisdom for anyone interested in learning more about this complex human activity." "Leadership Matters is the book my course on leadership has been waiting for -- a volume that intelligently embraces, rather than avoids, the paradoxes inherent in the subject." "A unique, well-researched, and well-written book on leadership that has been needed for a long time. This book is the one I have been thinking about writing. Now I won't have to, because Cronin and Genovese have already done it very well." "The authors cover a remarkable amount of ground... it is a spur to closer examination of areas it touches on... Recommended."